I shared in a previous post how you can use vinyl as a stencil for watercolors. If you haven’t read that, check it out here. Today I’m going to show you a different way to use your Silhouette to create beautiful watercolor paintings by using a sketch image. I’m no artist, but I can sure fake it by having my Cameo draw the image with a pen and then painting inside the lines. (And if you are a real artist, keep the snickers to a minimum :). (Yes, the instructions are long, but the process can be very easy). Let’s talk first about the different types of designs to use. These go in order from easiest to hardest to use. If you start following the directions and get overwhelmed, just pick a simple image and skip the steps you don’t need. While you don’t want to try to cut a sketch image, they work well for a watercolor project like this. Sketch images often have a series of overlapping lines that give a hand-drawn look and add shading. This type is even better for using as a watercolor base. If your sketch file is like the first example and you want it to be more like the second, you can add some of the extra lines (either in the software or by hand) or, with Designer Edition, turn the file into a sketch image and alter the look (more on that below). A cut image is meant to be cut out, so it has both length and width to every part. In other words, it has 2 dimensions. Here’s an example of the difference. On the left is a rectangle — a 2-dimensional shape. If I cut that out, I’ll end up with a piece I can remove from the page and use as a tag. On the right is a line — a 1-dimensional shape. Cutting that only gives me a slit in the paper. A cut design can work for a project like this — you just need to layer up the pieces. I’ll show you more about that below. Most designs are cut files. As long as you put a pen in the machine instead of a blade, the lines are drawn instead of cut. One note of caution is needed here. With some of the fill and edge effects, what you see on the screen isn’t exactly what is drawn. I’ve made the mistake before of increasing the density of the pattern to get more of it. I didn’t see any difference on the screen, but it ended up drawing WAY too many lines. If you are doing this for the first time, just practice on some cardstock before you use your more expensive watercolor paper. I created this design from a raster image by drawing my own lines. Common raster images are jpg, png, gif, tiff files and photographs. They are images with print information. I put the picture on the drawing area and used the drawing tools to create lines. What I needed was just the basic outline. I’ll post a link here to a more detailed tutorial on that once I’ve written it. I had the machine draw very simple lines, then I added some shading lines by hand afterward. I could have drawn more lines in the software but it was faster to just do that portion manually. On this one I used the same procedure, but started with a photograph. By breaking up the lines into shorter segments and drawing in a wavered fashion, it looks more like I sketched it by hand. –I like to use a realistic-looking image, but you can get very different looks by using other types. –You’re looking for something that is an outline so that you can paint inside the lines. Single piece designs are easiest for a first try. Also pay attention to whether or not the design has a background piece that all other pieces are laid upon. –You don’t want something that is a 3D design, a rhinestone design or a print and cut. …decide if you need to remove the cut line. A cut line is included on the outside so that you can sketch the image and then cut out around it. On most designs, it’s the outermost line. On others, it’s a separate piece. Sometimes it’s an integral part of the design. Here, I’ve colored the cut line red and the sketch lines black so you can see what I’m talking about. You may also want to remove the outer edge. It depends on the image. If the outer line is a background piece that all other pieces are laid onto, it’s usually fine to remove it. If the outer line is an integral part of the design, you may want to leave it. The flower on the left has that background piece so I removed it. In the design on the right the stem of the flowers goes away completely if I remove the outside piece, so I usually leave it. …and what it looks like after I’ve layered the pieces. …that could be a hot mess for sketching if it makes crisscrossing lines. But don’t worry — there’s a fix. Filled shapes are easier to grab and this helps you see the order of the pieces — which is in front of another. This will make a big difference in the next step. I almost always work with filled pieces in the design phase. You may need to ungroup the pieces first. If you aren’t sure how they fit together, it’s handy to use the split screen feature. That allows you to view your drawing area and the library or the Silhouette Design Store at the same time. The thumbnail (tiny picture of the design) will show you how the finished project should look. I like to do the split screen with the SDS because the images are larger than those in the library. I removed the leaf background pieces (what’s lighter green in the thumbnail) because as I layered the design I realized I didn’t need them for making this a sketch. Watch for any pieces that are in front of a piece they need to be behind. Here, the leaf is in front of the flower but I need it to be behind. To change that I select a piece, right click and change the order with send to back, bring to front, etc. …open the Modify window and choose Subtract All. This will act like a bathtub full of water falling through all the floors of an apartment building. It will cut holes on each level as it goes down but in the end all the pieces still remain. It won’t look like anything has happened, but when you move a piece you’ll see. Since I’m sketching, this gives me a better idea of what lines will be drawn. It will also show me if there are 2 lines on top of one another. You’ll notice a slightly darker line color where that’s happening. Remove extra pieces as needed if you want just a single line. That may even require some point editing. Or, shift the duplicates slightly and make extras of other pieces if you want the look to be more sketchy. Play around and have fun with this. Make it as simple or complex as you like. If you want to use more than one pen color for sketching, you can select a different line color for each piece and use the Advanced Cut Mode to cut by line color. For this type of project I typically use all black. Some sketch designs you purchase may already have different line colors, so you can change them all to a single color to visualize your project better. But as long as you cut in Standard mode, it won’t matter what color the lines are. At this point I group everything so I can resize and move it all together. Once I’ve done that I’m ready to go. You can use Silhouette sketch pens or use your own pen in the pen holder. I like the RSVP pens by Pentel. I find that they write for me every time and last forever. They also deliver a thin, consistent line. Test your pen to make sure the water will not cause the ink to bleed. Set Silhouette Sketch Pen as your material type in the Cut Settings window (even if you are using the pen holder). This automatically sets Sketch Pen as the blade type. That’s important because the machine mechanism handles the blade differently than the pen. For more information on using pens, see my post here. Now you can load your mat and send your project to the machine. If you don’t have sketch pens or the pen holder, you can actually print this to your home printer. –Make sure your printer can use watercolor paper. It’s thicker than normal paper. –Sketch lines are vectors, which means they are treated the same as cut lines. Vectors don’t have print information so you need to add some. Select your image, open the line style window and raise the line thickness to any amount that looks good to you. As long as it’s above 0.0, which is the default, the lines will print. If you want just very faint lines, you can instead check the box “Print Lines of Selected Shapes” at the bottom of the panel. –Make sure none of your design still has a fill color. Those would print as well because fills are print information. You can leave your design on a full sheet of paper or cut out around the outside edge of your shape. Once your project is out of the machine, add extra lines by hand if you want. There’s no right or wrong here. Just enjoy! I actually have no professional advice here because I just wing it. I do know I like to leave some clean space in the design — areas where I don’t put any paint. This one is for a friend battling breast cancer. 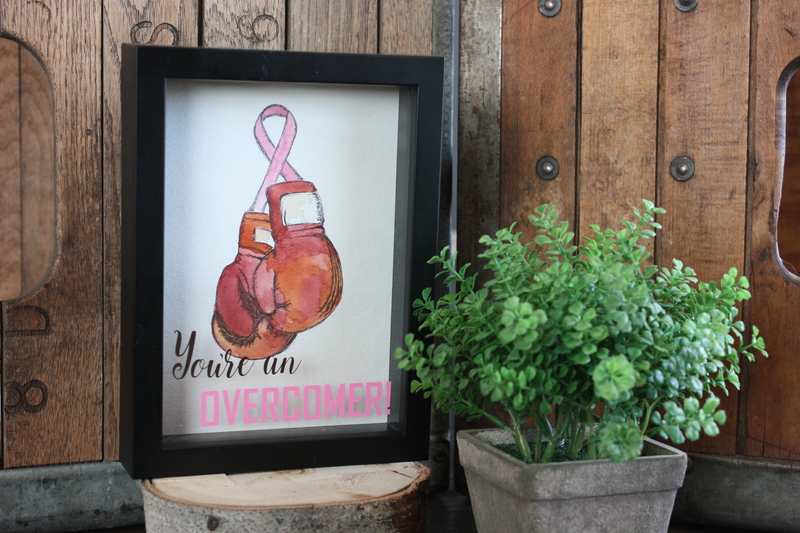 I added an encouraging phrase to the outside of the glass on this shadowbox frame using vinyl. 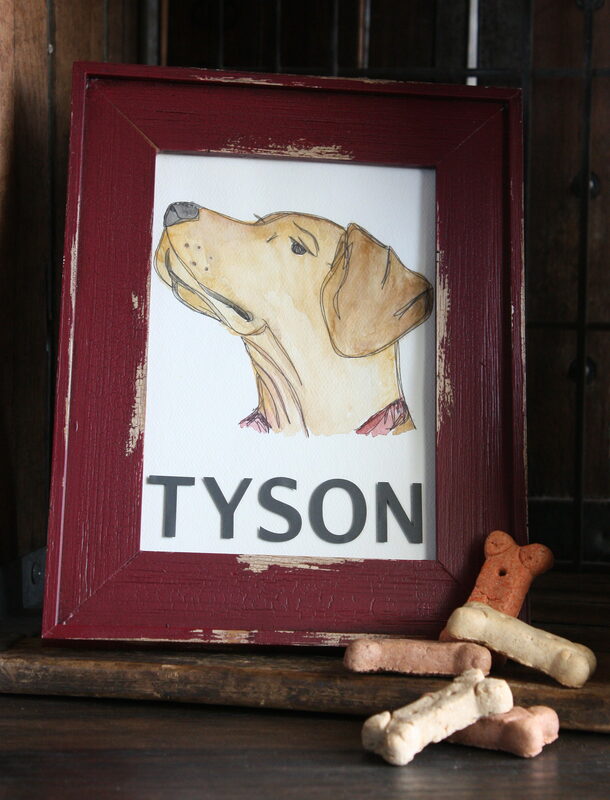 This sketch image from the Silhouette Design Store has always reminded me of our dog, Tyson. It’s Dog Sketch by Cali Arroyo, design #45970. This one is for my husband’s office. So get painting! 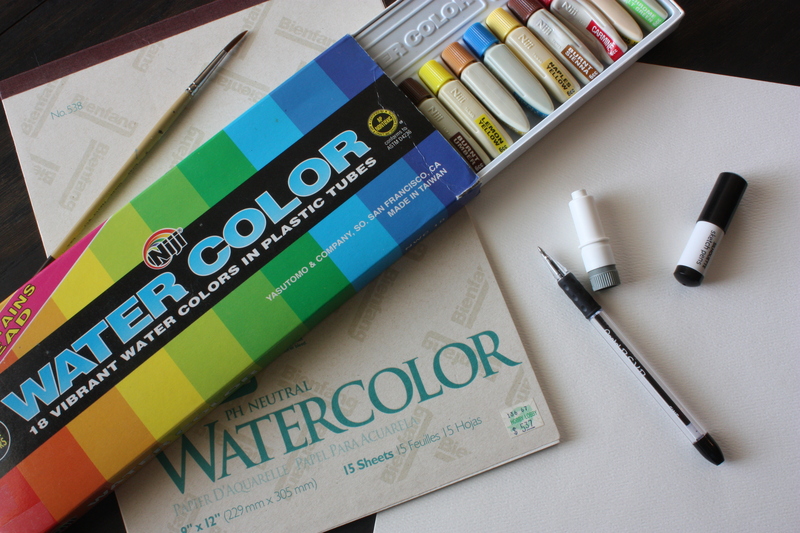 I bet you’ll feel like a kid again when you get to use watercolors. Let me know how you did! Wow, Thank you so much for taking the time to put this together. I have been playing with pens in my machine for years and never could get the hang of it. Ive read and watched so many guides but they all had more to do with working with fonts then anything else. Im so excited to give these tips a try. I just have to order a new pen holder first as my sketch pens are probably all dried up buy now . Once again, thank you so much!! Awesome tutorial. Thank you so much for sharing. I just need to get good at using watercolours now. When you use a pen of any type, you’re going to have a higher likelihood of the material sticking to the mat. That’s because the force of the pen is pushing into the mat. The thicker and more dense your paper, the less likely it is that you’ll have problems releasing it from the mat. So, watercolor paper works better than, say, a thin patterned paper. Here are some general tips for cutting paper and removing it from the mat: 1) The better the quality of your paper, the denser the fibers, so the easier it is for it to hold together. 2) When you first get a new mat, pat it on your jeans or an old t-shirt. This puts a few fibers on it that break down the sticky a bit. It’s a fine balance, because you don’t want to remove too much of the stick. 3) Try the light hold mat if you cut thin or delicate materials a good deal. 4) After the cut, flip the mat over and peel it up from the paper rather than peeling the paper off the mat. That way the mat is bending, which means the paper doesn’t curl. 5) I keep several mats on hand with varying levels of stickiness. As you gain experience, you learn how much stick you’re going to need for any particular material. Great tutorial. I want to scan a wedding photo then have my cameo sketch it. Is that possible. Yes, you can. However, there’s not a super easy way to do it. Since a photo is a raster image, you have to create vectors from it. You can do that 1 of 2 ways. 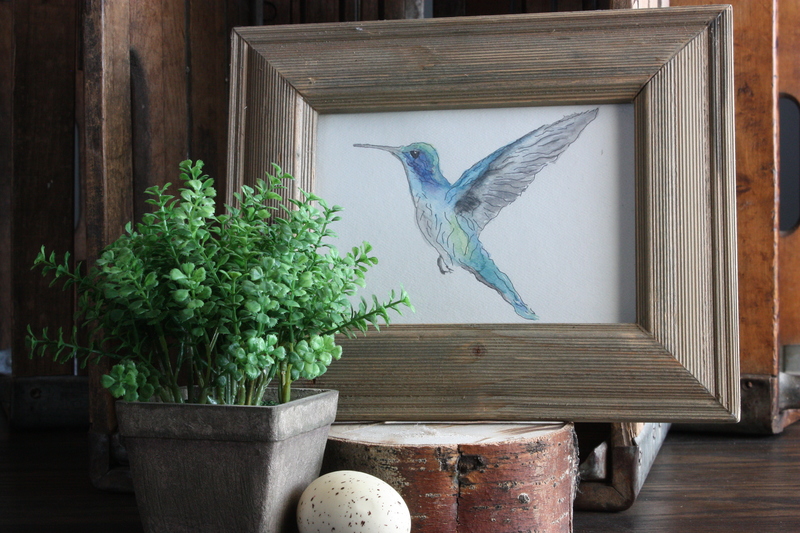 The first way is to do as I did with the hummingbird — put the photo on the drawing area and draw lines with the drawing tools. That’s pretty time-consuming and hard to get accurate. The second way is to trace the image. 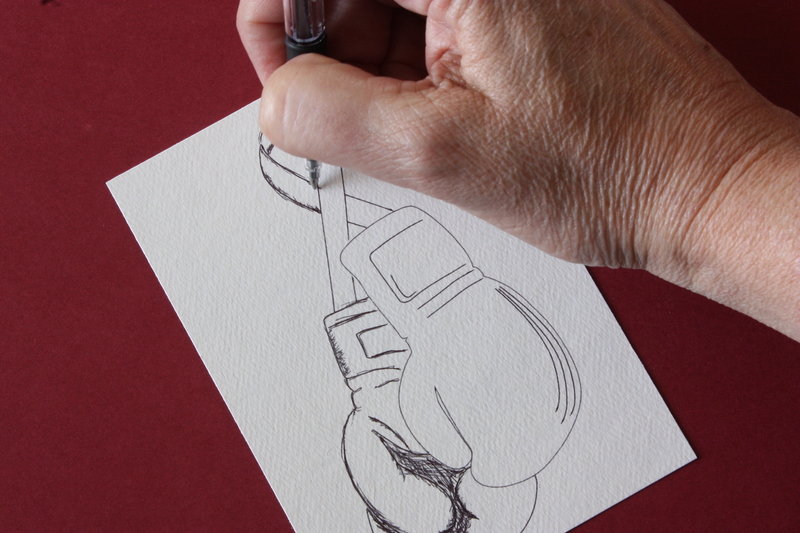 The problem with that is that it’s going to create double lines, as it did with the boxing glove. The best way I’ve found is to use another app or software program to create either a pure black and white image (not gray scale), which is easier to trace, or some create actual vector files (svg). I’ve use Adobe Capture (apple app), Inkscape (free graphics software), Microsoft Power Point, PicMonkey (online photo editing) and more. There are many websites and apps doing it nowadays — too many to list. They are basically doing the tracing for you in an application created specifically for that purpose. I usually try several to see which is going to get the best results with my particular photo.